The popularity of Fiddler on the Roof (1971), producer-director Norman Jewison’s film adaptation of the long-running Broadway musical stage play (1964-1972), runs along several dimensions: drama, music, dancing, and even sociocultural or philosophical ideas. In fact it was the sociocultural side of things that made the musical unique and ensured the broad popularity of the film, as well. Indeed, the film adaptation follows the musical play very closely, and attempts to translate the theatrical magic of the musical as much as possible into the film medium. However, adapting such a musical play (in fact any musical play) to film presents difficulties and tradeoffs due to differences across the two types of media, and I will discuss that below. Of course, the musical play was an adaptation, itself. It was based on stories in Sholoam Aleichem’s 1894 book Tevye and His Daughters, which was originally written in Yiddish. Aleichem’s stories concern the travails of a peasant Jewish dairyman who works hard to support his family in a small town, Anatevka, in the western edge of the Russian Tsarist empire (now Ukraine). For the musical play, these stories were woven into a single tale about life in the traditional Ashkenazi Jewish culture (Yiddish language sphere), which naturally had an interested audience in Broadway’s home, New York City, where about 2.5 million Jewish people, many of Ashkenazi descent, were living in the 1960s when the musical was opened. But, of course, the themes and events of the play have a much wider cultural compass than just a single ethnic community. The Fiddler on the Roof. In the opening images of the film, Tevye points to mysterious man, perhaps an apparition, playing on his fiddle while standing precariously atop the peaked roof of his peasant house. The fiddler metaphorically represents the eternally precarious position of the Jewish people (and by extension all of us) on this earth. The fiddler must continue to play his life’s “tune”, while at the same time attempting to maintain his balance in the face of all of life’s vicissitudes. Tradition. The Jewish people have managed to endure in the face of so many challenges because of their staunch adherence to their traditions. These traditions specify the proper and authorized activities in all aspects of life. For example, men always keep their heads covered and wear a little prayer shawl. Of course, traditions are followed in all conventional societies, but the implication here is that the strength of Tevye’s people is their meticulous adherence to the full range of their religious and cultural traditions. The film’s opening song, “Tradition”, is a musical celebration of this notion. So throughout the unveiling of the four subplots, we are to understand that Tevye is seeking to be the “fiddler on the roof”, trying to maintain his balance, a crucial support of which are the heavenly-ordained traditions of his people. But there is another important cultural element that is not articulated here but which represents a crucial aspect of how Tevye and his people make their way. Tevye believes in a single, all-powerful God that he can somehow talk to. This is something additional to ordinary social traditions. There are many cultures that follow strict social traditions, for example traditional Confucian Chinese society, without much reference to heavenly spirits. In addition there are other cultures that either have numerous heavenly spirits, some lower elements of which may have a personal interest in an individuals life (e.g. traditional Indian culture), or have a single, all-powerful spiritual essence that is remote from human concerns (e.g. Theravedic Buddhism). But it is the Abrahamic religions, initiated by Judaism, that have a single God, Who is the creator of all and yet Who can receive personal prayers, too. 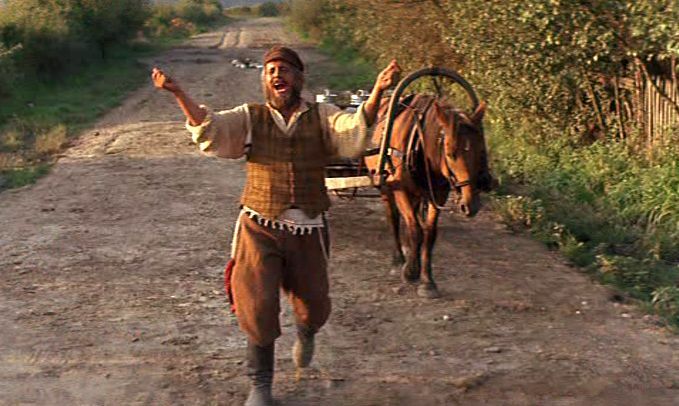 So throughout the story of Fiddler on the Roof, Tevye talks directly to God and tries to understand His reasons for making things as they are. These conversations with God are in fact one of the narrative innovations of Fiddler on the Roof, because the unseen narrative witness of the film seems to stand in the perspective of God’s perception. When Tevye speaks into the camera, there is a bit of ambiguity – the narrative listeners is the audience, but it also sometimes seems to be God. It is as if we viewers are in an “over-the-shoulder” camera position with respect to God. At various critical moments in each of the four subplots, Tevye is required to make a decision, and he take a moment to reason with himself concerning what he should do. The external world freezes for a moment, while Tevye recites to himself, but also to God and to us, the various pros and cons concerning a particular action. “On the one hand,” he says on each occasion, there are these particular concerns, but “on the other hand”, there are counter-arguments that need to be considered. These conversations with God reflect a man’s reasoned struggles to maintain his precarious balance on that existential “roof”, and they provide some of the charm of the story. In contrast to these larger themes, the four subplots are not as interesting, but they drive the story. Tevye has five daughters, three of whom are of marriageable age, and it his task to find husbands for him in his community. According to tradition, the marriage arrangements must be made in the order of the daughters’ ages. In addition, tradition dictates that the father makes the arrangements with the intended husband, with the daughter having no say in the matter. So the first three subplots, which are somewhat interleaved, concern the marriage arrangements for the three older daughters, and the three marriages signal three modernist challenges to tradition: (1) industrialization and automation, (2) peoples’ revolutions, and (3) liberal humanism. The fourth subplot depicts the expulsion of all the Jews in the region as a result of a pogrom. 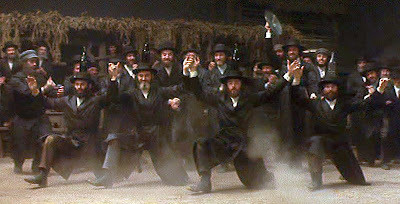 Although Aleichem’s book was first published in 1894, the film is set in 1905, during a time of one of the amajor anti-Jewish pogroms in Russia. Tevye’s oldest daughter, Tzeitel, is in love with Motel, an impoverished young tailor in the village. But Tevye’s wife, Golde, learns through the local match-make, Yente, that the more prosperous, middle-aged butcher in town, Lazar Wolf is interested in marrying Tzeitel. So Tevye goes to Lazar Wolf and seals the deal with a handshake. But when Tzeitel is confronted with the prospects of marrying the elderly butcher, she protests, and Motel steps in to plead his case for her hand. Tevye now engages in his first back-and-forth reflective consideration, observing that his traditional authority is being challenged, but that his daughter’s future happiness is at stake. In the end, he succumbs to Tzeitel’s wishes, and Motel and Tzeitel then run off through the neighboring woods singing the song, “Miracle of Miracles”. Hodel, Tevye’s second-oldest daughter falls in love with an educated and city-bred young revolutionary, Perchik. He is a modernist who seeks to overthrow many outmoded traditions, including the idea of servitude to the Tsar. Accordingly, he insists to the local villagers that women should be allowed to dance with men, and he tells Tevye that he and Hodel intend to marry, without first asking for Tevye’s permission. 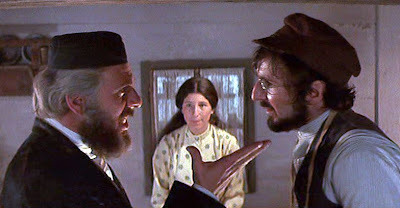 Again Tevye has a dramatic wrestle with his pride and conscience, but he ultimately consents to this marriage, too. 3. Chava’s storyThe third daughter, Chava, falls in love with a local Christian man, Fyedka, and they seek to marry, as well. But this time, Tevye cannot accommodate such a break with tradition, and he refuses to allow the marriage. When Chava and Gyedkadecide to go ahead and marry anyway, Tevye disowns his daughter for choosing to leave her religion. The final section of the film shows all the people of Anatevka evicted from their homes and forced out of the region as a result of the pogrom. The message here is that reasoned forbearance, rather than suicidal retaliation, in the face of cruel oppression may often be the only option for survival. Returning to the problem of presenting a stage musical on film, there are things about the cinematic version of Fiddler on the Roof that work, and others and don’t. A stage production always features a certain psychological “distance”, with respect to what is presented. There is a seated audience watching actors on the stage, with a seated orchestra and singing chorus. When the story is transferred to the more realistic and immediate film medium, things are different, and the artifices of the stage seem more conspicuously artificial. On the other hand (to echo Tevye), the film audience wants to see the musical they have hear about without alterations. So the filmmaker must insert the orchestra, the chorus singing, and the dances, even when they seem much more intrusive in the cinematic setting. On top of that, there is the question of how far to go depicting the agonies of the pogrom. In this respect there are clear limitations to what can be staged in a theater and for an audience that expects music and dancing on the stage. A film is less limited. For this reason there are elements of the film that are relatively effective (the “good”), and others aspects that don’t deliver (the “bad”). The Bad. There are several elements of the film that limit one’s enjoyment. Particularly irritating are the bizarre camera angles and the jarringly rapid editing. These effects are presumably intended to provide visual dynamism to what might be thought of as a static stage play, but they have no motivation behind them and are merely distracting. There are too many closeups, and the various high and low camera angles are confusing and counter-intuitive. Surprisingly, however, veteran cinematographer Oswald Morris won an Oscar for his work here. A second problem with the film is its overall length, which at about three hours runs on too long. Most of the story, except for the expulsion, and the best songs are covered before the intermission, so the second half of the film seems to drag. A third problem is in connection with the final expulsion from the village. Curiously, the realism of the cinematic medium, when combined with the necessity of faithfully following the stage play’s restrained depiction, make it seem flat. The film shows the various characters heading off to new homes in New York, Israel, and Chicago – it seems everyone has some place to go. But I suspect that the real story was more dour. The pogrom at that time forced people with limited means off their own land and with limited protection from the civic authorities. Thousands of people lost their lives. The Good. . . . on the other hand, . . . The acting performances of Chaim Topol (Tevye), Norma Crane (Golde), Rosalind Harris (Tzeitel), and Leonard Frey (Motel) are simultaneously engaging and realistic. Topol (who wasn’t that old at the time of production) is particularly good in the demanding role that dominates and carries the entire narrative. Unfortunately however, Topol’s raspy voice gets to be a problem after awhile, particularly in some of the songs. There are a number of songs in the film that are justly famous, including, “If I Were a Rich Man”, “Matchmaker”, “Miracle of Miracles”, and “Sunrise, Sunset”, as well as the famed “bottle” dance. In fact it is the performance of “Sunrise, Sunset” where the vocals, the visuals, and the overall mood all come together perfectly, that is an unmatchable experience and the highlight of the film. Anyway, what is it about Jewish culture that has inspired them to such success  and has enabled them to adapt to and survive so many disruptions in varied circumstances over the years? There are other factors besides just tradition, for example: communal exchange and concern, an eschatological belief that the Supreme Spirit has selected them for a chosen destiny, compliance to precepts recorded in the “Good Book” (the Tanakh), and a general confidence that problems can be solved through reasoned investigation and skillful application. Or maybe it is all of these elements and more that are somehow artfully combined in this perilous, ever-changing world in the fashion of that maestro fiddler. Coupled with the successes of the Jewish people has been the unceasing envy and hatred on the part of many outsiders. Even nowadays, the president of a major Middle Eastern country has urged his followers (prior to his election) to hate Jews – for example, to “nurse our children and our grandchildren on hatred” for Jews and Zionists. http://www.nytimes.com/2013/01/15/world/middleeast/egypts-leader-morsi-made-anti-jewish-slurs.html.